My lovely partner for the BSBP sent me lovelies! I am thrilled that we were able to connect so quickly, and am so glad to have met Bobbie of Beadsong. She's a wonderful person, and we're having fun getting to know one another. We seem to have lots in common! The beautiful lampworked flower focal bead is by Elizabeth Girod, and look at all the beads Bobbie included in my soup!! 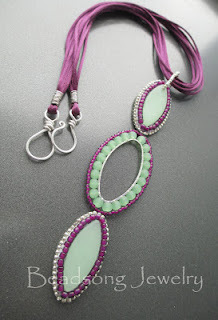 I love the clasp she made especially for my piece, too - so jealous, as I can't work with wire no matter what I do. I'm lucky if I can make a wrapped loop without hurting myself, lol. I wanted to get a photo of allllll the beads together, but the amethyst, onyx, agate and red onyx would NOT sit still on my white background and I had to resort to the bead mat. I think it will be a challenge for me to work with these colors, and that's always a good thing - streeeeeeeetch!!! My apologies for the short post today, but I'm swamped and have to run. Cheers!! Loooong time no post... sorry! There has been a lot going on in life right now, and so I have neglected a lot of things, including my blog. Some bad things and some really great things, both. Of the lovely, beady, NEDbeads type things, there are a few!! Marcia DeCoster's new book, Beads In Motion, is coming out very soon and I am very excited, as Marcia decided to include one of my pieces in her gallery. Check it out HERE to see some examples of the lovelies she is going to share with us!! I can't wait to make some of these designs, they all look scrumptious!! 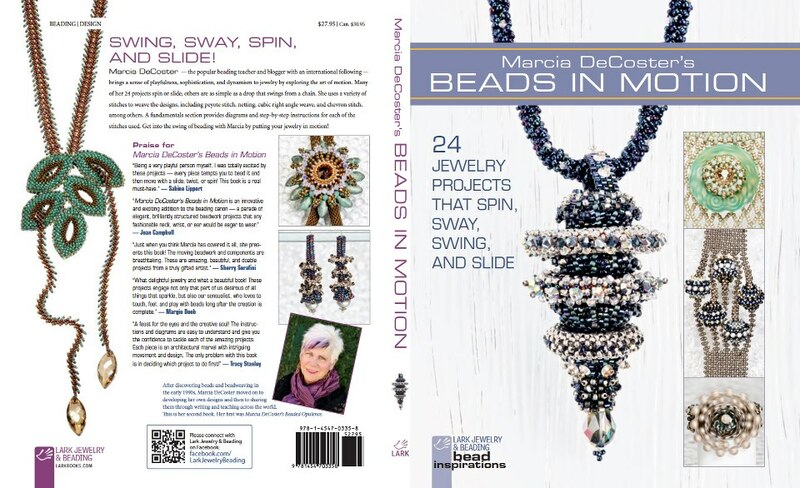 I am also participating, for the first time, in the wonderful Lori Anderson's Bead Soup Blog Party, and am very excited about that as well. If you aren't familiar with the party, check out Lori's blog and see, it's fabulous!!! 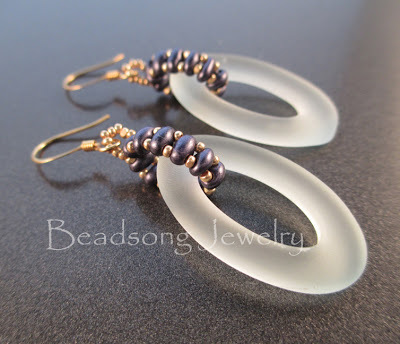 My partner is the talented Bobbie Rafferty of Beadsong Jewelry!! I am absolutely thrilled, and having gone through and read Bobbie's blog, I am LOVING her work. Look at some of this beauty!! The earrings are amazing, the necklace is sublime and I am particularly in love with this gorgeous freeform peyote bracelet. I have been hooked on freeform myself lately, and just can't seem to stop. I made up Bobbie's soup and sent it out this morning - actually, I sent two because I wanted to make sure that she had something to choose from. I can't wait to see what she thinks, and if she likes what I chose! (Fingers and toes crossed!!!) I would love to post a teaser pic, but I honestly don't know how to 'disguise' a photo, so I had best wait, lol. Our reveal date is 4/6/13 as we are part of the second group. 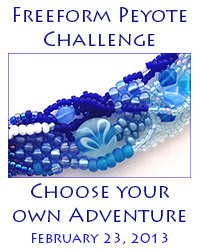 I am also taking part in a wonderful blog hop called Choose Your Own Adventure (seriously, how could I resist with a title/theme like that??? 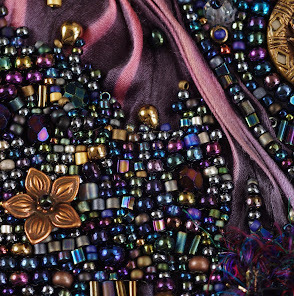 ), hosted by Mandi Ainsworth (of the Bead Circle) and Karen Williams (of Skunk Hill Studio), where the participants are to make a freeform piece. Mandi does amazing podcasts and has a fabulous site - make sure to click on her link and check it out. She recently did a podcast with Karen, and introduced the challenge there, and Karen introduced it on her website as well. If you'd like to know more about the hop, check that out here on Karen's blog. 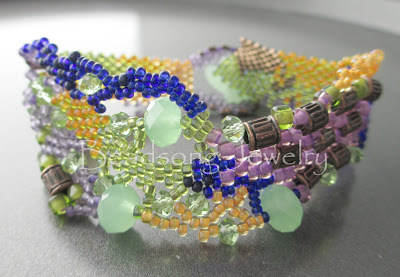 Karen does amazing freeform work and is the author of several beading books, too! I have been working on this for awhile now, and am actually making a mini series of pieces of freeform. It's been a wonderful exercise so far and I can't wait for the reveal date, February 23rd. 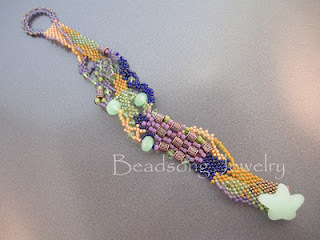 They have also started a new community page on Facebook called Freeform Peyote Beading, where there is a LOT of eye candy to be found, and some really great tips on freeform beading. A friend of mine has also asked if I will participate in an embroidered art doll round robin with a few of her close friends. This is a very new sort of thing for me, as I have never beaded on a form before, only on flat embroidery backing. I am looking forward to it a lot, although maybe a little worried too, as I think it must be very different from my normal embroidery. I've chosen to do a bird form for mine, made by Renetha Stanziano (I can't sew - NO I can't!). In order to practice a little beforehand, I am also going to try embroidering a starfish form, which is being made for me by my fabulous friend Julie Cowan . So... beadiness = busy-ness = calm. I need calm right now. And courage was definitely the word for the year as I deal with the bad things.